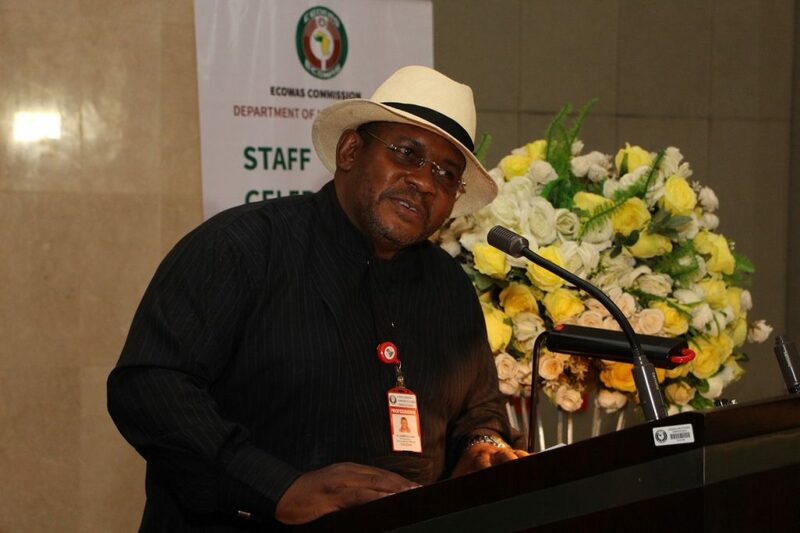 In a vivid demonstration of its commitment to staff motivation, the Commission of the Economic Community of West African States (ECOWAS) celebrated its retiring staff on the 22nd of March 2019 in Abuja, Nigeria. 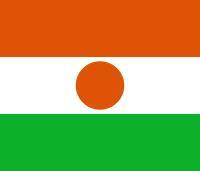 At the ceremony which also held to enable staff simultaneously take in the Commission’s New Year goodwill message, the President of the ECOWAS Commission Jean-Claude Kassi Brou spoke about more beautiful, and fruitful days head for both staff and friends of the Community. President Brou noted that following the continued implementation of Community programmes and projects in different areas through the guidance of the Heads of State and Government and the combined staff efforts, notable achievements have been recorded which include the institutional reforms and related productive activities. Also highlighted, were encouraging progress with regard to the single currency programme, political, peace and security programmes in several countries, social and humanitarian programmes for women, the youth and the poor, transport facilitation programmes as well as strides in energy, agriculture, education, culture and health sectors. Further, President Brou credited staff for the general progress made by the Commission on the institutional, political, security, social and economic fronts. The president gave his word that, through the reforms and in accordance with the recommendations of the Council of Ministers, provision will be made for more training, to enable staff advance in their career path just as the Commission’s staff regulations are to undergo a review in order to be “more consistent with contemporary staff policies”. “We will also modernise our organisational structures, improve efficiency, provide training and ensure stability among staff” The President added. While expressing his appreciation to the staff for their years of dedicated service to the community, he pledged that the management team on the saddle was committed to the achievement of set objectives. Special recognition was also given to the ECOWAS female forum, social and sports club, with the president of the Sports Club Mr. John Umoren presenting Mr. Brou with the giant trophy among others won by the commission’s sportsmen and women during the diplomatic games. 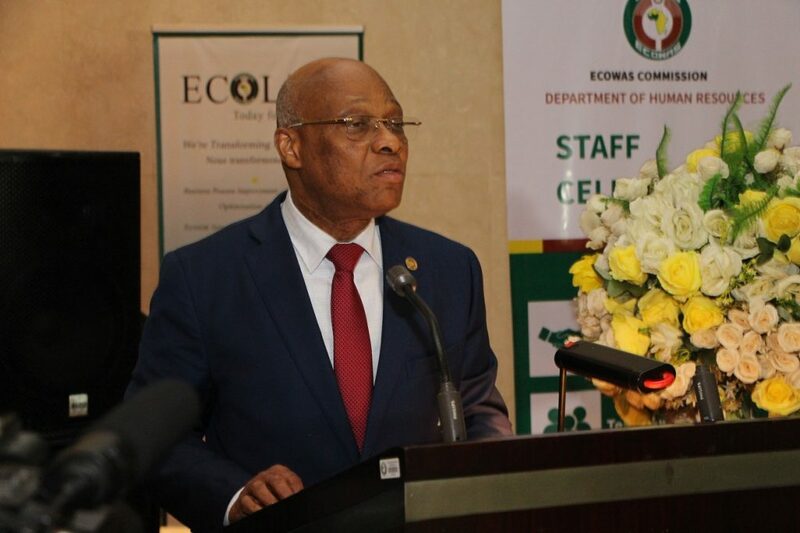 On his part, the ECOWAS Commission’s Commissioner for Human Resources Dr. Jeremias Furtado highlighted the manifold programmes put in place to motivate staff which he listed to include sporting activities, appraisals and talent management systems. Stating the appreciation by the Commission of the professional competence of the work force at ECOWAS, he disclosed that his Department is determined to ensure the transformation of the Commission’s productivity delivery structure which will go a long way in meeting the integration objectives of the community. The ECOWAS Commission’s Staff Representative Dr. Tony Elumelu enthused that having institutionalised an association of retirees, the growing number of “ECOWAS Ambassadors” out there will bring about greater commitment by those still engaged, to the ideas of meaningful integration and co-prosperity of the region. He expressed the hope that the concerns raised by the commission’s staff bordering on the enhancement of better service delivery will be diligently attended to. Her other colleagues who are billed to retire from the Commission in 2019 are Mr. Oluwafisan Bankale, Ms. Ami Mercy Kwawu, Mr. Mahamane Dédéou Toure, Agyeman-Duah Osei Tutu, Mr. Mr. Samuel Kofi Balo, Mr. Agbedeyi Adegboyega and Mrs. Akom Violet Ukpanyang. 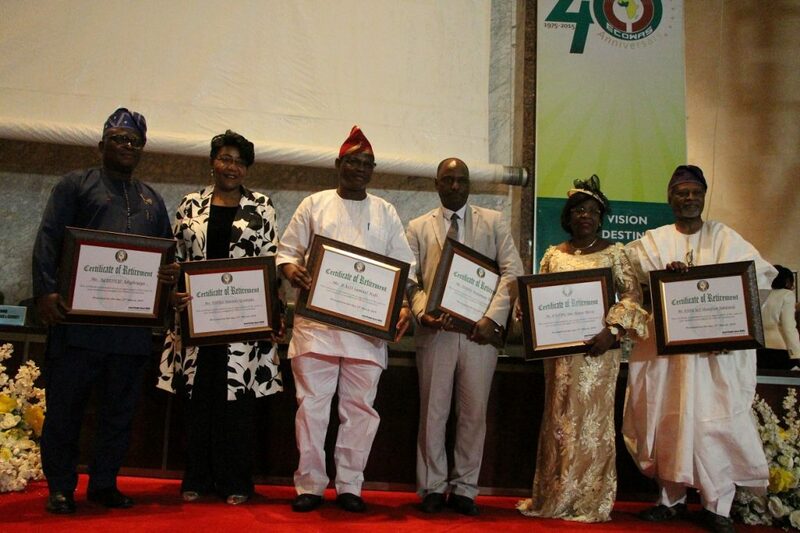 The ceremony also featured the introduction of the executive Bureau of ECOWAS female forum led by Hajia Raheemat Momodu as well as a presentation of team and individual performances awards in recognition of distinguished services to the institution. Among the recognitions given were team awards which went to the Directorates of Political Affairs and Multilateral Surveillance while Individual awards were handed to the Director, Human Resources Mrs. Amelia Kone and the Office Manager, office of the President Mr. Raoul Attoh-Mensah. The high point of the event was the cutting of the 2019 cake, with all activities culminating in a cocktail.